All the 14 outlets shall be enabled from both the supplies. Please note that the total SWITCHING CAPACITY IS ONLY 15A across all outlets. 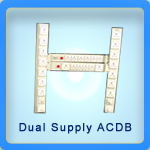 There is a 32A MCB for EACH power supply at the back. The switch over is by means of a high speed relay that does not reboot the equipment connected to it.